Welcome to my homepage! 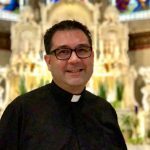 We plan to post my weekly homilies here, and other information that I will share. So, if you were out of town and want to hear what I said, or simply want to listen to it again, please enjoy! Each homily also has a brief summary as well.